Chaos Breaker reveals his latest Grade 3 form. 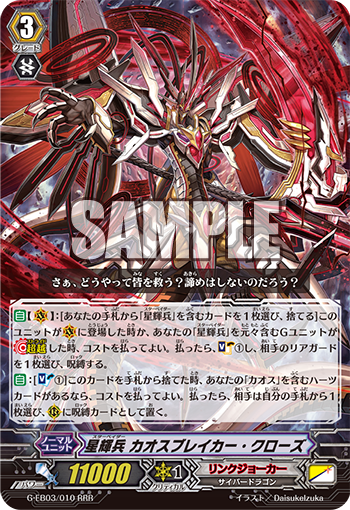 AUTO (VC) [Choose one card with “Star-vader” in its name from your hand, and discard it] When this unit is placed on (VC) or when your G unit with “Star-vader” in its original card name Stride, you may pay the cost. If you do, Soul Chage 1 and choose one of your opponent’s rear-guards, and lock it. AUTO [Soul Blast 1] When this card is discarded from hand, if you have a heart card with “Chaos” in its name, you may pay the cost. If you do, your opponent chooses one card from his or her hand, and puts it on (RC) as a locked card.